Christian Petersen/GettyAndre Iguodala might like golf as much as he likes basketball. 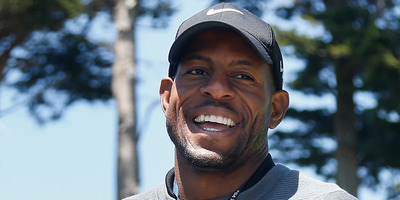 Andre Iguodala is a golf fanatic who considers himself one of the better golfers on the Golden State Warriors. Iguodala, who will be contributing commentary to TNT for the PGA Championship, broke down the games of some of his teammates to Business Insider. While Iguodala said he’s better than players like Klay Thompson and Draymond Green, he said Stephen Curry is one of the best golfers he’s ever played with, just a notch below some pros. Andre Iguodala has been credited as one of the emotional leaders of the Golden State Warriors and a coach on the floor. His on-court contributions have been just as important. Iguodala is key playmaker and defender off the bench, and he won the 2015 Finals MVP for his defence on LeBron James and his shooting. And by his own account, he’s one of the best golfers on the team, too. Iguodala, like many NBA players, is nearly as into golf as he is basketball. Iguodala was always a fan of the game, but estimates that he began to play more frequently in the last five years. Now, he’ll get a chance to show off his knowledge for the sport when he contributes commentary for TNT during the PGA Championship, starting Thursday. While speaking to Business Insider to discuss his preparation for the major and his overall love of the game, Iguodala gave some scouting reports on his teammates. First up was Stephen Curry, whose virtuosity on the course is well-known. Curry has competed in some professional tournaments in recent years to mixed success, but is considered one of the best golfers in the NBA. Iguodala can attest to it. “Steph’s one of the best golfers I ever played with, period,” Iguodala said. He said Iguodala has played with pros like Justin Thomas and Ricky Barnes, but said Curry is just a notch below them. Iguodala said the best round he’s ever seen from Curry came at the TPC Stonebrae in Hayward, California, where Curry shot a 67. Iguodala said he hopes to see Curry perform similarly when Curry competes in the Ellie Mae Classic at Stonebrae next week. He said Curry doesn’t golf as much as he’d like to but he can shoot under par on any given day. Iguodala was slightly less flattering toward his other teammates, however. For instance, Iguodala brought up Draymond Green when asked about the worst golfers in the NBA. Iguodala also took a shot at Klay Thompson, who he said has misplaced confidence in his game. Iguodala said Thompson might have more natural talent than him, but he hasn’t mastered the intangibles yet. Iguodala didn’t break down everyone on the Warriors roster, but he did say he hopes to one day play wth head coach Steve Kerr. Iguodala said he’s heard Kerr was a good golfer, but because of back pain following surgery three years ago, Kerr hasn’t played as much. “I haven’t seen him play too much. I’ve seen him hit a few wedges. His back was messed up, but he had pretty good game. He was really good … I think he shot 60s a couple times. But Steve has some game. He had like the Jim Furyk swing,” Iguodala said, referencing the pro with a somewhat awkward, vertical swing. In general, Iguodala said there are many bad golfers in the NBA, but he, of course, had to mention Charles Barkley, whose swing lives in infamy. Still, Iguodala couldn’t be too critical. Unlike Barkley and Michael Jordan, however, Iguodala said he and his teammates don’t make big wagers on rounds. Whereas Jordan used to bet hundreds of thousands of dollars (according to Barkley), Iguodala said the Warriors mostly play for bragging rights.